England coach Stuart Lancaster knows he has increased the scrutiny on himself with his team selection for Saturday's key World Cup match against Wales. 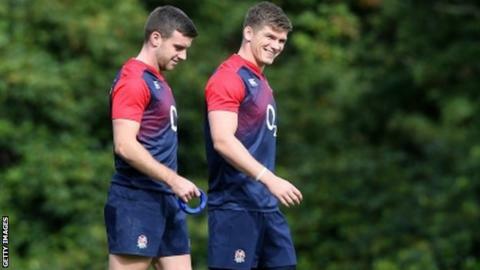 Lancaster has dropped fly-half George Ford in favour of Owen Farrell and brought in Sam Burgess in the centres. England beat Fiji in their first match, while Wales got the better of Uruguay. Lancaster said: "The game will be judged a success if we win. If we lose I will be questioned. Clearly my selection heightens it." Jonathan Joseph's chest injury has prompted the changes in England's backline. With Burgess paired with Brad Barritt, Lancaster is fielding the 14th centre partnership of his four-year tenure. Just 11 months since he switched codes, and after only 112 minutes of Test rugby, Burgess will be up against British and Irish Lion Jamie Roberts, capped 72 times by Wales. "We need to have good defenders to stop Wales on the gain-line," said Lancaster. "Sam's a good and powerful defender. But also I think he offers us a threat in attack. We don't always have to use the threat that he is. Sometimes you can bypass him." Lancaster said: "Obviously George is disappointed, but in the same way it is about how you deal with disappointment. "In my mind, they are both word-class players and we are just playing in a different way, a different order."